The 1885 Liberty Nickel is an Important Key Date Coin in the V Nickel Series. In 1883, the Liberty Nickel was issued for the first time. Perhaps as an oversight or error in judgment, the word CENTS was omitted. The only face value indicator was the Roman numeral "V" on the reverse. Racketeers seized on this opportunity to gold plate the V 5 cent nickel as pass them off as $5 gold. Soon thereafter, the word CENTS was added to the design. Large numbers of the 1883 Liberty Nickel were set aside because people thought they would someday be valuable, which explains the humble price of the 1883 today. No one was paying any attention in 1885 when only 1.4 million nickels were struck, and of this small mintage, few were saved. The 1885 Liberty Nickel is rare in all grades, most notably in Uncirculated condition. 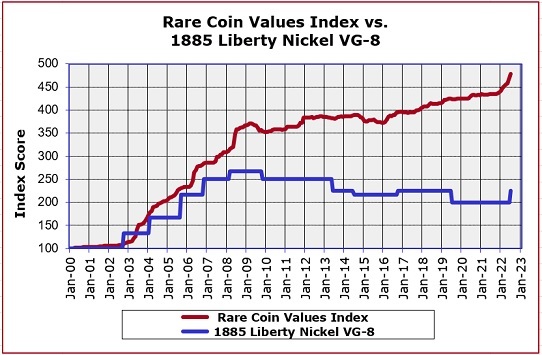 The blue line tracks the percent change in value since Year 2000 of the 1885 Liberty Nickel in VG-8 condition, starting with a baseline score of 100. The red line operates in the same manner, graphing the progress of the Rare Coin Values Index, which represents the combined percent change in value of a group of 87 rare US coins, ranging from half cents to double eagles. The objective of the Index is to measure the strength and direction of the overall rare US coin market. Despite its solid status as a key date U.S. coin, the 1885 Liberty Nickel rates a bit below average compared to the Index. Nonetheless, this is a great coin to have, and no one should be dissuaded from adding one to their collection. The Index is updated monthly.